Federal grand juries in New York and Washington state have indicted Chinese telecommunications giant Huawei Technologies and its subsidiaries for stealing robotics secrets from T-Mobile, and illegally doing business with Iran, Trump administration officials announced Monday. A grand jury in New York charged that Huawei Technologies operated a front company in Iran, Skycom Tech Co., that illegally hid financial transactions involving tens of millions of dollars with Iran in a bid to avoid U.S. sanctions laws aimed at curbing financial dealings by the Islamist regime in Tehran. Separately, a 10-count indictment issued in Seattle states that Huawei Device Co., Ltd. and Huawei Device USA, Inc., Huawei subsidiaries, stole through economic espionage protected information on a T-Mobile phone testing robot called Tappy. The spying involved breaking in to the company's facilities in stealing trade secrets. Huawei, according to emails obtained by U.S. investigators, also offered cash bonuses to company employees worldwide for stealing foreign technology to support the company. The New York indictment also included charges against Huawei Chief Financial Officer Meng Wanzhou, who was arrested by Canadian authorities Dec. 1 and is facing extradition to the United States for the Iran-related financial crimes. The indictments come amid ongoing talks with China aimed at resolving the U.S.-China trade dispute over Beijing's unfair trade practices and illicit acquisition of U.S. technology. The White House announced on Monday a new round of trade talks with Chinese officials would be held Wednesday and Thursday. China has denounced U.S. action against Huawei as economic warfare and denied the company engages in espionage or illicit activities. Chinese Foreign Minister Wang Yi said on Saturday that the treatment of Chinese companies like Huawei by foreign countries is "unfair and immoral." Polish authorities earlier this month arrested a Huawei executive in Poland along with a former Polish security official on espionage charges. Huawei fired the executive, Wang Weijing. The former Polish official, Piotr Durbajlo, was a senior counterintelligence official. Huawei is the world's largest telecommunications company and has sold millions of handheld phones around the world along with routers, switches, and other equipment. Huawei equipment is banned by the Pentagon over concerns the gear is outfitted with backdoors that permit remote access by Chinese hackers. Several other countries, including Australia, have banned Huawei products over security concerns. The European Union also is considering a ban over the spying fears. Legislation introduced earlier this month in Congress would ban the sale of U.S. microchips to Chinese telecommunications companies found to be in violation of U.S. export control laws. In addition to Huawei, a second Chinese telecommunications firm, ZTE, also has been linked to Chinese spying and illicit activities. 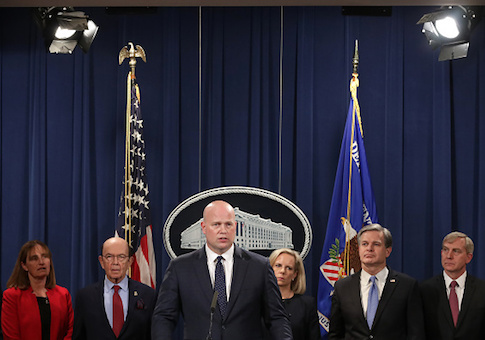 "Today we are announcing that we are bringing criminal charges against telecommunications giant Huawei and its associates for nearly two dozen alleged crimes," Acting Attorney General Matthew Whitaker said in announcing the cases. "As I told Chinese officials in August, China must hold its citizens and Chinese companies accountable for complying with the law." Whitaker said the indictment does not allege the Chinese government was involved in the economic espionage and illicit dealings with Iran. FBI Director Christopher Wray told reporters that under Chinese cyber laws, however, all companies, including Huawei, are required to provide the Chinese government with "access" to all products and thus the company poses a national security threat. U.S. intelligence agencies have linked Huawei to both Chinese intelligence and the military and the ruling Communist Party of China. Huawei was designated a "national champion," by the state, making the company a pivotal player in China's global drive for high-technology and economic supremacy. "These charges lay bare Huawei’s alleged blatant disregard for the laws of our country and standard global business practices," Wray said. "Companies like Huawei pose a dual threat to both our economic and national security, and the magnitude of these charges makes clear just how seriously the FBI takes this threat," he added. "Today should serve as a warning that we will not tolerate businesses that violate our laws, obstruct justice, or jeopardize national and economic well-being." Noted Commerce Secretary Wilbur Ross: "For years, Chinese firms have broken our export laws and undermined sanctions, often using U.S. financial systems to facilitate their illegal activities. This will end. The Trump administration continues to be tougher on those who violate our export control laws than any administration in history." The economic espionage indictment includes charges of trade secrets conspiracy, attempted theft of trade secrets, wire fraud, and obstruction of justice. That case involves company employees targeting T-Mobile USA, headquartered in Bellevue, Washington, from 2012 to 2014. "This indictment shines a bright light on Huawei’s flagrant abuse of the law—especially its efforts to steal valuable intellectual property from T-Mobile to gain unfair advantage in the global marketplace," said Assistant U.S. Attorney Annette L. Hayes from Western District of Washington. The indictment reveals that in 2012 Huawei launched an operation to obtain the robot technology to boost their own robotics for testing Huawei phones before they were shipped to T-Mobile and other wireless carriers for resale. Huawei engineers violated confidentiality and non-disclosure agreements with T-Mobile by secretly photographing smartphone-testing robot Tappy and obtaining technical specifications of the robot and in one case stealing a piece of equipment from the robot for copying in China. When T-Mobile discovered the economic espionage and threatened to sue, Huawei produced a report that falsely blamed rogue employees for the activities. The indictment states that the company was fully behind the operation and emails obtained by investigators showed that it was company-wide and involving engineers and employees from both Huawei Device companies. One email from July 2013 revealed that Huawei offered bonuses to employees that would be based on the value of the information they stole from other companies around the world. The company provided an encrypted email address to send the stolen trade secrets. The indictment related to Iran includes charges that Huawei and its subsidiaries, along with senior executives like Meng, carried out fraud, conspiracy, bank fraud, wire fraud, violations of U.S. sanctions laws, money laundering, and obstruction of justice. The Iran charges surfaced in an investigation of a bank that was linked to illicit Iran financial transactions that was used by Huawei to do business in Iran in violation of U.S. sanctions laws aimed at preventing Iran from obtaining nuclear goods. Th indictment charges that beginning in 2007 Huawei officials lied about Huawei's ties to Skycom by falsely stating that it was not affiliated with Huawei. Huawei also lied in stating that it had limited operations in Iran and that the company did not violate U.S. or other laws and regulations related to Iran. Meng and other Huawei employees also lied to the company's banking partners about the Iran business. The U.S. government is seeking the extradition of Meng, who is the daughter of Huawei chief executive officer Ren Zhengfei. In one case, an international bank and its U.S. subsidiary transferred more than $100 million of Iranian funds through Skycom between 2010 and 2014. U.S. sanctions prohibit banks from processing financial transactions related to Iran through the United States. Huawei obstructed justice by moving witnesses familiar with the Iran dealings to China and outside the reach of U.S. investigators. This entry was posted in National Security and tagged China, Huawei. Bookmark the permalink.